Kansas City, Mo. 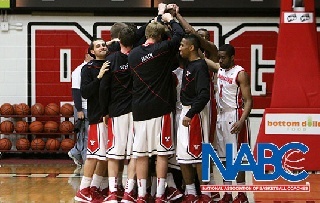 -- Youngstown State was one of 96 men's basketball teams honored by the National Basketball Coaches Association (NABC) earning an inaugural Team Academic Exellence Award, the association announced on Thursday. These awards recognize outstanding academic achievement by a team with a cumulative grade point average (GPA) of 3.0 or better for the 2012-13 season. The Penguins posted a 3.01 grade-point average and seven players have a own a cumulative grade-point average of 3.0 or higher. Three players, Blake Allen, Kendrick Perry and Mike Podolsky, were named to the NABC Honors Court. The Honors Court recognizes players with overall grade-point averages of 3.2 or higher. In order to earn a NABC Team Academic Excellence Award, an institution must count the grade point averages of all men's student-athletes competing during the 2012-13 season in NCAA Division I, II, III, and NAIA Division I and II.